Paramount's resident tough guy Alan Ladd finds himself spying in France during the Second World War in this pretty routine drama that's given dignity by the strength of the star's performance. 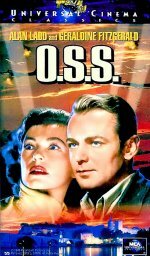 As the movie is so obviously a Ladd vehicle, there are no other stellar names in support; Geraldine Fitzgerald is an attractive though unexciting heroine and Patric Knowles is as wooden as ever. Ladd was making roughly three films a year at this time and was one of Hollywood's hottest properties. Today he is largely remembered for Shane, but it was films like this that helped create his image and consolidate his stardom. Spy drama starring Alan Ladd and Geraldine Fitzgerald. During the Second World War, many US civilians volunteer for training with the Office of Strategic Services. The successful candidates must make sacrifices for their country; some will pay the ultimate price.